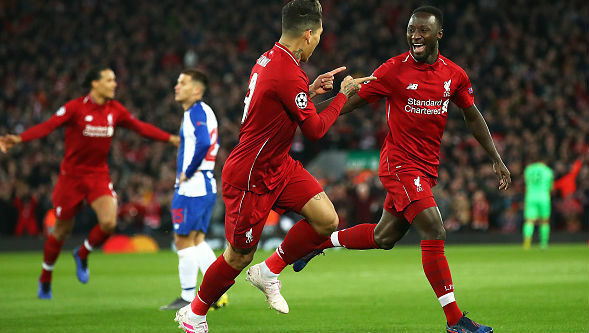 Liverpool, April 10: Liverpool closed in on a Champions League semi-final meeting with Barcelona or Manchester United after sweeping aside Porto 2-0 in the first leg of their quarter-final tie at Anfield. Far from the late drama that has accompanied the Red's Premier League title bid of late, Naby Keita and Roberto Firmino struck inside the first 26 minutes to put the hosts in command. Manchester United vs Barcelona - Live Football Score, Match 208 - Summary. "2-0 is a really good result, I would have taken it before the game and I take it now," said Liverpool boss Jurgen Klopp. "It was a good game, a controlled game. We deserved the win 100 percent and scored two wonderful goals." Liverpool's only regret may be not building a more emphatic lead to take to Portugal for next week's second leg. It took the hosts just five minutes to open the scoring as Keita got his second goal in as many games having waited nine months to open his Liverpool account. The Guinean got the benefit of a big deflection off Oliver Torres as his strike from the edge of the area left veteran goalkeeper Iker Casillas helpless. Soon, though, Alexander-Arnold was helping twist the knife into Porto at the other end with his eighth assist of the season. Jordan Henderson, playing in a more advanced midfield position than normal, cut the visitors' defence open for the England international to square for Firmino to tap into an empty net. "Hendo is a brilliant player and I'm really happy he can show that again," said Klopp. "He likes that position so it is my fault he played for one-and-a-half years as the holding player, but we needed him there." Only a matter of centimetres denied Liverpool a third early in the second half when another excellent Henderson allowed Sadio Mane to volley home, but the Senegalese was flagged offside. The fine balance Liverpool must strike in maintaining their quest for European glory while also trying to end a 29-year wait for a league title was in evidence as Klopp withdrew Mane and Firmino in the final quarter with one eye on Sunday's Premier League visit of Chelsea. However, that proved a luxury that Liverpool could afford to take as they look set for a second Champions League semi-final in as many years.